Almost any time you walk into our home, you’ll find a slow cooker on our countertop. We use it so often that we rarely put it into storage. Multiple times a week, we’ll drop some ingredients into that slow cooker at the start of the day, turn it on low, and enjoy a homecooked meal at our convenience in the evening. Without our slow cooker, it would be very difficult for Sarah and I to have a low-cost delicious home-cooked meal on the table for our family every night. Instead, we’d be going out to eat much more often or preparing expensive and relatively unhealthy prepackaged meals. Transitioning to using a slow cooker for your meals at home is pretty straightforward. The first thing you need is a slow cooker. For a family, I recommend picking up a Crock-Pot SCCPVL610-S, as it provides six quarts of cooking space and a bunch of easy-to-use programmable features. For a single person or a couple, I’d point toward a Cuisinart PSC-350, a smaller model which is also programmable. However, your best bet is to watch Craigslist or look at yard sales, as slow cookers are items that sometimes pop up in those contexts. Once you have a slow cooker, start experimenting. There are thousands upon thousands of slow cooker recipes online and in cookbooks. Search for whatever ingredients or dishes you like using Google and just add on the terms “slow cooker” to find anything and everything you might want to try. If you need to cook a recipe longer than the recipe calls for, add a quarter of a cup of extra water. This is perfect if you’re going to leave the food cooking for an hour or two longer than the recipe calls for. The environment inside the slow cooker is a steamy one and extra water prolongs the magic and keeps your food from drying out. Don’t overfill. I try to keep my slow cooker less than two thirds full. The reason for that is that if something boils or rises unexpectedly while you’re out of the house, you’re going to have a disaster on your hands when you return home. Most things won’t rise at all, but every once in a while, something in there will boil up unexpectedly. If you find it’s juicier than you like, turn it on high and remove the lid. When it gets close to dinner time, I’ll check the slow cooker and see if the dish is juicier than I might want. If it is, I just remove the lid, kick it up on high, and check it half an hour later or so. Not only does the house start smelling delicious, the food ends up just right. Don’t put anything frozen in the cooker (unless specifically directed to do so). Frozen foods tend to drastically alter the cooking environment inside of a slow cooker. Since frozen foods are so cold, they tend to really increase the time it takes for meals to cook in there, since it takes so much longer for them to get hot. This can significantly alter cooking times and can even be unsafe for your health. If I’m using a frozen ingredient, I make sure to at least thaw it before putting it in the slow cooker. 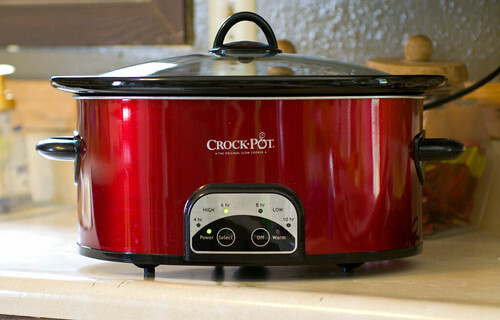 A slow cooker is an incredibly valuable tool for any busy family. It opens the door to home-cooked meals when time constraints – working parents, children with extracurricular activities – can make it difficult for a great meal to be prepared and everyone to sit down together at once, and since home-cooked meals are a real money saver over other meal options, a slow cooker can make all the difference in the world.